A couple of recent announcements in World Architecture News has definitely aimed the spotlight at Los Angeles for cutting edge parks and open space implementation. And this doesn't even include the local media-saturated Orange County Great Park (subject of some upcoming coverage of our own here at L+U). The first project is by one of the OC Great Park team members, LA-based Mia Lehrer + Associates (along with Denver-based team members Wenk Associates and Civitas). It's exciting to see collaboration between not just multi-disciplinary teams, but also amongst Landscape Architecture and planning firms to provide specific aspects of experience to a project, such as urban planning, water design focus, or environmental specialization. I expect for large-scale projects this makes more sense, but can be a model for other projects as well. 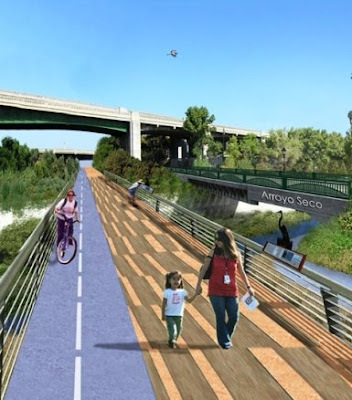 WAN profiled their work for a 'River Renovation at the Heart of LA' with a goal: "...to plan a comprehensive open space network in and around the Los Angeles River corridor." The summary continues to include the goals of the project: "Revitalizing the river includes four major goals: (1) enhanced flood storage, to slow flow velocities to enable reintroduction of vegetation; (2) enhanced water quality, through regional scale storm water treatment at river confluences, and localized “treatment terraces” at storm drain outfalls; (3) enhanced public access within the channel via terraces and ramps, small pocket parks and ponded areas; and (4) a restored riparian ecosystem." This involves an expansive vision that included not only the river itself but extends into the surrounding urban fabric: Via WAN: "Greening the neighborhoods extends the River’s influence into adjacent neighborhoods, encompassing five goals: (1) creation of a continuous River Greenway that serves as the City’s “green spine;” (2) reconnecting neighborhoods to the River through a system of “green streets;” (3) recapturing underutilized or brownfield sites in park-poor areas as neighborhood parkland, and incorporating stormwater management practices into all public landscapes; (4) enhancement of River identity through signature bridges and gateways, and through programmed events; and (5) incorporating public art along the River." 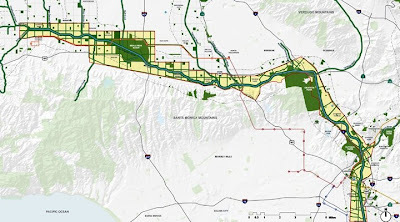 A recent summary involves a historic reinterpretation of Los Angeles State Historical Park and have connections to the overall LA River corridor as well. 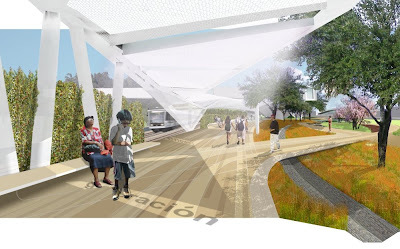 The winner of a recent design competition (via WAN): "...the Hargreaves Associates proposal restores the lost connection of the people of Los Angeles to their history, their River, and to nature. The 32-acre park expresses the site's interwoven histories and cultural significance through the Nueva Zanja, tracing the route of an historic water channel and re-interpreting it as an historical walk that recalls the multiple histories and meaning of the site." 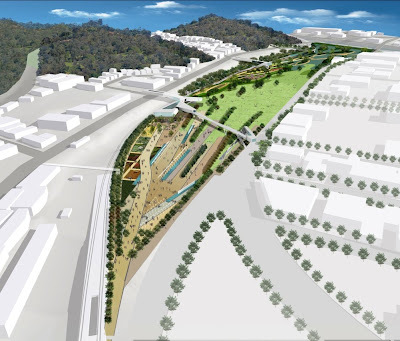 Again via WAN: "The design provides a plaza for gatherings and events, gardens and recreational spaces, pedestrian and fauna bridges, wetlands and interpretive centers. 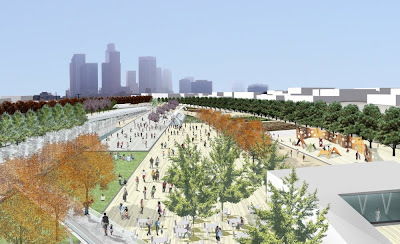 The project also provides a key link between the mountainous Elysian Park, and the channelized LA River. 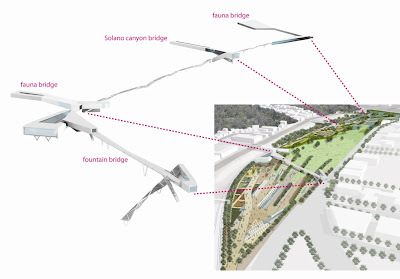 The project proposes a flexible edge to the LA River, adaptive to different possibilities for the future of the river that free it from its current channelized state." The connections to the river in this case are both accomodating of pedestrians, as well as habitat - including two 'fauna bridges' as shown in the diagram below. This acknowledgement of the overall habitat connectivity and accomodating types of urban fauna is an important trend of park development and aids in not just the physical restoration of the park and riparian corridor, but the liveliness of the social and ecological systems. And representationally, the graphics for this competition mimick many of the recent submittals including the illustrative collage technique that focusses not just on spatial form but is evocative of the use of materials and forms. 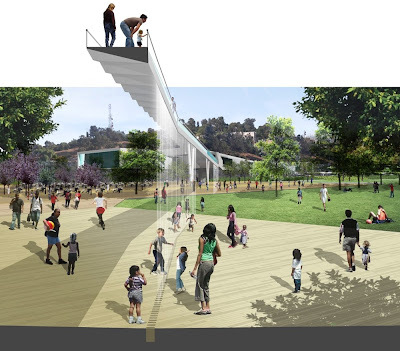 In this case, structures are more abstracted, rendered in a generic translucent white, which really accentuates the vegetative and site qualities such as the overhead structure (top), and the death-defying section cut stairway and water play feature (below) all populated with an appropriate multi-cultural cast of characters that is indicative of a LA user group for urban parks. 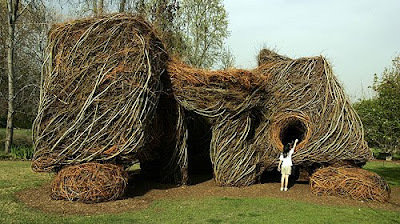 And we finish with a landscape art as semi-orgasmic experience, via the LA Times coverage of Patrick Dougherty's installation at the Los Angeles County Arboretum & Botanic Garden, and author Debra Prinzing's poetic summary: "Titled "Catawampus," the installation ... beckons from the main path at the in Arcadia, sunlight slipping between the warp and weft of twigs. The tactile quality of each thread-like branch appeals to me: the in-and-out, the over-and-under. I run my hand along the twisted surface, marveling at the density of 4-inch-thick walls. My fingers stroke the soft tips, velvet against the rough bark." FYI typo - it's Lehrer not Lerner. Thanks - will get that changed!